This interesting bromeliade forms a shape called a “polster” after many years. The big one in the photo we call “The Dude”. Partial sun to shade in sunny hot desert climates. Drought tolerant, but grows better with some irrigation in summer. Does not like to have water on leaves in cold weather. 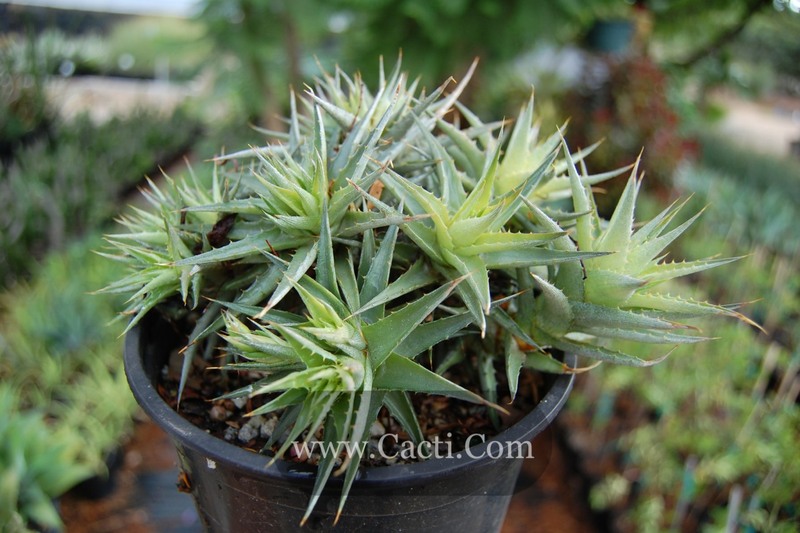 A nice plant for a small-scale groundcover in rock, cactus or succulent gardens. This bromeliad makes an interesting specimen plant in containers. Remove offset rosettes and replant. Also can be grown from seed. Fungal rots from overwatering in poor draining soils – requires excellent drainage. This is a perennial bromeliad that forms an interesting mounding ground cover. It grows by slowly dividing into a tight cushion-shaped colony. In its native environments, it is watered perhaps only twice a year, obtaining most of its moisture from the air itself. It is able to obtain extra moisture from ocean fogs that roll in. The leaves are shiny green on top, and lined on the underside. Deuterocohnia brevifolia has small green flowers throughout winter and early spring. The tubular flowers of are born in small clusters nestled among the leaves, are about an inch long and are green to yellowish-green in color. Deuterocohnia brevifolia and several other closely related species form an interesting growth shape with age. After many years it resembles a cushion or pillow, called a "pollster." Here at the nursery we refer to this large specimen as The Dudes Polster. Its been developing for about ten years. Great care must be taken when moving it around so as not to expose it to too much light and scorch the top.